Western Rifle Shooters Association: Vanderboegh: 'Defiance' -- "Without a rifle, you are nothing"
Vanderboegh: 'Defiance' -- "Without a rifle, you are nothing"
Defiance: "Without a rifle you are nothing, worthless; you are waiting for death, any minute, any second." "That is the first and foremost lesson of the Holocaust to be learned. For all the unanswered moral, philosophical and theological questions-- the bottom line is that millions of Jews were killed, because they could be. The only true defense against a Holocaust is the ability to resist and to survive one." One of the routine stops I make when I visit my parents in central Ohio is the Village Bookshop in Linworth, a suburb of Columbus. It is a remainder house, selling many obscure but important titles on all manner of subjects. In May of 1995, for the princely sum of $9.98 I picked up a copy of Nechama Tec's "Defiance: The Bielski Partisans -- The Story of the Largest Armed Rescue of Jews by Jews During World War II"
The prevailing image of European Jews during the Holocaust years is one of helpless victims under a death sentence, unable to fight consignment to the ghettos, to the camps, and to the gas chambers. In fact, many Jews struggled alone or with others against the terrors of the Third Reich, risking their lives against overwhelming odds for the slimmest chance of survival or a mere glimpse of freedom. In 'Defiance', Nechama Tec offers a riveting history of one such group, a forest community in western Belorussia that would number 1,200 Jews by 1944 -- the largest armed rescue operation of Jews by Jews in World War II. Describing the entire partisan movement in the region, Tec shows that while most forest fighters in Belorussia were rifle-carrying young men, the members of this extraordinary community included both men and women, some with weapons but mostly unarmed, ranging from infants to the elderly. She reconstructs for the first time the amazing details of how these partisans and their families -- hungry, exposed to the harsh winter weather, always on the lookout for German patrols -- managed not only to survive, but to offer protection to all Jewish fugitives who could find their way to them. Driven by courage born out of despair, they dug wells, set up workshops to repair guns, make clothes, and resole shoes, supplied services to other guerrilla units, and even established a makeshift hospital and school in the forest. Arguing that this success would have been unthinkable without the vision of one man, Tec offers penetrating insight into the group's commander, Tuvia Bielski, and his journey from his life as the son of the only Jewish peasant family in an isolated rural village to his emergence as a leader possessing the charisma and courage to command under all but impossible circumstances. Tec brings to light the untold story of Bielski's struggle as a partisan who lost his parents, his wife, and two brothers to the Nazis, yet never wavered in his conviction that it was more important to save one Jew than to kill twenty Germans. She shows how, under Bielski's guidance, the partisans smuggled Jews our of heavily guarded ghettos, sciouted the roads for fugitives, and led retaliatory raids against Belorussian peasants who collaborated with the Nazis against their former Jewish neighbors. Refusing to turn away the weak or the old for the sake of the survival of the larger group, Bielski would warn new arrivals to the forest, "Life is difficult, we are in danger all the time, but if we perish, if we die, we die like human beings." A scholar, a writer, and herself a Holocaust survivor, author Nechama Tec has devoted the last two decades to studying the fate of European Jewry, recording rare but vital examples of human compassion, resistance, altruism and heroism in the face of overwhelming horror and despair. Drawing on wide-ranging research and never before published interviews with surviving partisans -- including Tuvia Bielski himself two weeks before his death in 1987 -- she reconstructs here the poignant and unforgettable story of those who chose to fight. See why I bought the book? Although dust jackets are often the best part of some books, this one did not disappoint. So when I heard that they were making a movie about the Bielski Partisans, I was both excited and apprehensive. Hollywood has an almost limitless capacity for screwing up the best books -- David Brin's 'The Postman' comes immediately to mind. But if you read the review below here it would seem that, much like 'Valkyrie', Hollywood has once again given us Three Percenters a movie that will reinforce our message. And when Charles Schumer and Diane Feinstein see this movie, will they get the point? Read the book before seeing the movie, not only to understand where Hollywood screwed up, but to internalize the message that may be glossed over: that the only truly free men and women are those who are armed and thus possess the means of ensuring their own liberty and survival. 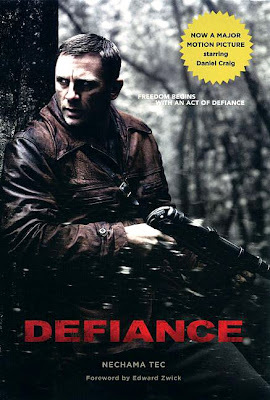 Last week I had the opportunity to attend a screening of Defiance, based on the Oxford Press book, Defiance, the Bielski Partisans by Nechama Tec. For those who have the time, I would recommend the book over the movie, as the former is a real history of events, and the latter is a fictionalized Hollywood adaptation of them. Nechama Tec's book, Defiance, the Bielski Partisans is a realistic but excellently written retelling of how the Bielski Otriad operated in the real world, its dedication to rescuing Jews, from refugees in hiding, to reaching inside Ghettos themselves, as well as dealing with its controversies. In contrast to the movie, Nechama Tec's Defiance is a nuts and bolts look at life in the woods from multiple perspectives. It is not an exercise in romanticism, but in realism. The story of the Bielskis is one of those stories of the Holocaust that is overshadowed by the general narrative of victimization and therefore rarely told, as compared to the depictions of Jews as helpless victims or dependent on non-Jewish saviors, ala Schindler's List. The story of the Bielskis is not a story of the Holocaust, so much as it is the story of how the Bielskis and those who worked with them broke through the helplessness, and took action to save thousands and keep them alive in hostile territory. In contrast to the movie's portrayal of him, Tuvia Bielski is not a modern morally conflicted hero nor a misguided idealist. The book is less about personalities than it is about what was accomplished in the forest. Yet even the movie provides something deeply valuable in the portrayal of the Holocaust. Liberal culture has made the Holocaust into a narrative of victimization that can only be undone by tolerance. Defiance, in both book and movie form, turns into a narrative of accomplishment by a few in the face of a seemingly unstoppable enemy. The Jews of Defiance are not victims, they are taught to take responsibility for their survival by the Bielskis. They do not simply wait for the war to be over, but Tec's book documents how they rescue other Jews, and they fight back, blowing up trains, and hitting Nazi targets. The conventional narrative of the Holocaust, both liberal and religious, is one of learned helplessness, of martyrdom, either in the name of tolerance, or holiness. Defiance instead upends that in favor of competence, of taking responsibility for one's own survival and that of others, and making a difference. It is the conceptual idea behind the State of Israel, and so unsurprisingly one of the forest encampments was called "Jerusalem in the Woods." The usual liberal narrative teaches that when tolerance fails, a Holocaust happens. But tolerance is relative, while competence is objective. Understanding what the Bielski Otriad accomplished is far more important to understanding how to deal with the persecution of Jews, than all the narratives of atrocities and massacres, which memorialize the dead, but fail to draw any useful lessons from what happened to them. And the only useful lesson that can be drawn from the Holocaust, is how to survive it and defeat it. Watching Defiance made me think of how fundamentally wrong most other movies have gotten the Holocaust. The poster child of all of them of course was Schindler's List, a grandstanding and hollow project, whose two major stars played Germans on opposite sides of the Holocaust, and whose them was about the importance of doing the right thing. But movie after movie has followed a similar pattern, turning the Holocaust into a vehicle for communicating something uplifting about the human spirit, and the general wonderfulness of humans, when they aren't busy shoving other humans into gas chambers or dark pits. Jakob the Liar, Life is Beautiful, The Pianist all suffer from that same need to turn an atrocity into something meaningful. Defiance though is one of the few Holocaust movies, that is actually a war movie. It is not about finding meaning, as much as it is about the hard realities of survival, and what must be done to survive. Being a Hollywood movie it still suffers from the need to insert uplifting messages about the human spirit, but these quickly pass. But they quickly pale beside the reality of the choices that the Bielski brothers need to make. As often as the movie attempts to "straighten out" the story by directing it along a politically correct route, the truth of the real story bends it back to where it began. The Bielski brothers are no saints, but start out as smugglers who end up using their survival skills to gather a large community of survivors under them. At times they're ruthless and like everyone else, they're walking wounded, dealing with the loss of their families, while being expected to make impossible decisions that mean life and death for everyone around them. But there are no therapists in the forest, only life and death decisions. Much as the score layers on inappropriately uplifting music and the writing summons the occasional inspirational line about hope, faith and humanity-- Defiance's heart is in the forest where the needs are primitive and survival rests on the ability to get food and weapons and to stay ahead of the Germans and their local police collaborators. And stripped of all the questions and philosophical musings, Defiance is one of the few movies to deal with what the Holocaust was about. Surviving. The Holocaust boils down to the simple fact that many of the groups who hated the Jews got a chance to kill them, under the leadership of German Fascism and administered with ruthless technical precision. Reactions across the Jewish populations covered a wide gamut that history has barely scratched, from apathy to flight, to denial to collaboration, to resistance. The Bielskis and the fighters, criminals and working class youth, have the survival skills that the Malbushim, the middle and upper class university educated Jews do not. That meant knowing how to use a gun, how to find your way through the woods, how to build working shelters and ultimately how to survive by making ad hoc decisions under pressure. It also meant being able to eat anything and make food out of anything, including a horse and a dog, to rob and to kill. There is nothing "natively" uplifting about any of that. It is simply what it takes to survive. And that, rather than the uplifting messages, serves as the real lesson of the Holocaust. You either survive, or you don't. The Holocaust is not a call for tolerance or for sanctifying victimization, those are the liberal American Jewish fallacies. The Holocaust was a wake up call, warning that none of the strategies that Jews had used until now, negotiation, waiting, appeasement, all defense reactions had been nullified. You could give up, run if you could, or fight to survive. Israel was built on the understanding that the time for running was over. It was time to get serious about being a nation, or live as hunted animals the world over. The American liberal Jewish consensus by contrast was built on the belief that the best way to prevent a Holocaust was to teach people to love each other and find something uplifting in it all, thus buying into the culture of victimization. Defiance tries to reach for the latter position, but finds itself stuck in the former camp instead. Because as many noble and uplifting things that Tuvia can say, the Bielskis, both the real and the fictional film versions, were no liberals. The movie portrays a tug of war between the two older Bielski brothers, over focusing on pure resistance or rescuing people. But that division leads both brothers to disaster, as Tuvia discovers that he needs his sibling's ruthlessness and Zus' participation in a Russian partisan unit leads to the realization that the Communists have just as little use for the Jews as the Nazis do. The balance of Tuvia's idealism and Zus' cynical killing edge defines the conflict, as Tuvia discovers that he must be hard and brutal in order to do good, and Zus discovers that killing without a people of his own to protect is a cold and soulless task. Though the movie may insert inappropriate comic relief and its versions of the Bielski brothers are at times so incompetent that they would not have survived for a week, let alone for years, it does what Holocaust movies all too often avoid doing, it focuses on the survival. The Germans, when they arrive, are soldiers in gray moving in and out. The locals collaborate or don't, for their own reasons. There is no moral to be learned, except that if you want to live and want others to live, you must be prepared to do what it takes. That is the first and foremost lesson of the Holocaust to be learned. For all the unanswered moral, philosophical and theological questions-- the bottom line is that millions of Jews were killed, because they could be. The only true defense against a Holocaust is the ability to resist and to survive one. Before the State of Israel was officially declared, the Bielskis made their own Jewish state in a forest, to live as free men and women mere kilometers from their would be killers, and though like the real state and its real leaders, they may have been flawed, their triumph is not some uplifting moral, but a matter of accomplishment, the 1200 they hid in the forest against all odds, and through determination and hard work, they did not become victims or fatalities, they survived. And through their guidance and efforts so did 1200 others. No higher praise is needed. "Defiance: The Bielski Partisans -- The Story of the Largest Armed Rescue of Jews by Jews During World War II"-This one is available from the LA county liberary system. It's a great read!